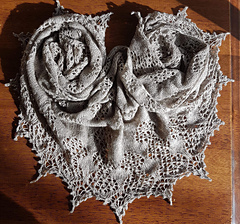 I’m hosting a KAL in my Ravelry Group here for those of you who would enjoy some lovely company while knitting your shawl. 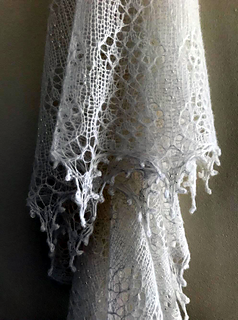 Inspired by my sister-in-law who got married this year, the Lovebird shawl was my gift to mark her special day. 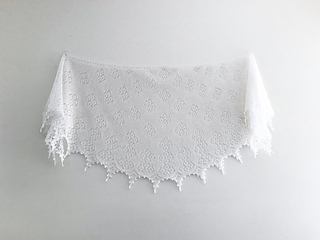 I designed it for luxurious laceweight (2ply) yarn and used a neutral colour for this heirloom piece but it also looks amazing in bright colours too. 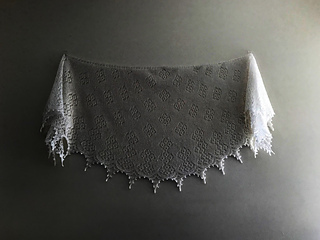 The shawl features separate falling lace motifs that settle into an elegant border finished off with beautiful decorative peaks. A sprinkling of beads throughout also makes for a truly special knitted piece that’s perfect for yourself or for someone you love. This pattern requires some concentration, so the PDFs included are very comprehensive. Written instructions are provided for EVERY row, with stitch counts, marker information, and notes. Full charts are also included as well as a tick sheet. 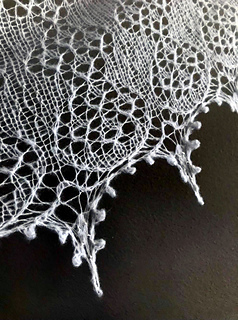 This video from Fiberific will help you learn How to Knit with Beads and Hook or Floss. That’s where I learned and also purchased my beads. 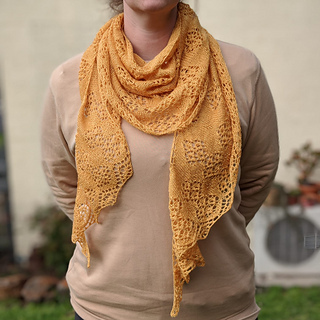 This video from KnittingVortex shows how to perform a DEC5to1K. 2 skeins Filatura Di Crosa Superior 300m/328yd 25g (sample used 50g in col. 1). 1 skein Yarnarama Yak/Silk Lace yarn 800m/875yd 100g (sample used 66g). Pair of 3.5mm (US 4) and 4mm (US 6) needles. I like to use an 80cm circular needle set but straight are fine also. 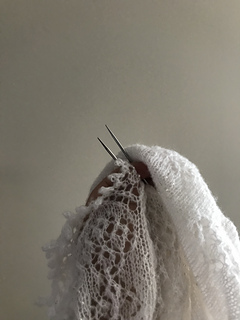 The larger needles are optional for a loose cast off. I advise the use of at least 4 stitch markers to separate the edge stitches and the incomplete repeats at either side. You will need 34 markers to separate every repeat. Size 8 seed beads approx. 450 (I used 15g Miyuki beads col. Crystal Ivory Gold Lustre for the Filatura Di Crosa Superior sample) and 0.6mm crochet hook for applying your beads. Approx. 22 sts and 32 rows to 10 cm/4” over pattern using 3.5mm (US 4) needles (after blocking). This will vary based on yarn choice. Filatura Di Crosa Superior sample: 185cm (73”) wingspan, 54cm (21”) depth at centre. 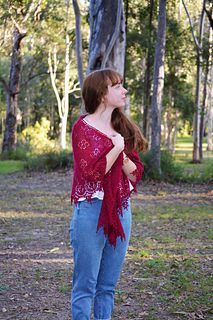 Yarnarama Yak/Silk Lace sample: 180cm (71”) wingspan, 48cm (19”) depth at centre.